NewSoft Technology Corporation, long engaged in the development of video and audio multimedia, introduced a number of popular video and audio multimedia processing software from its own R & D. Keeping an eye on new application and development trends, NewSoft is committed to providing simple and easy-to-use video/audio processing software in line with modern daily life and work. In addition to launching its own brand (VideoWorks), more advanced audio and video technology has been provided for customer requirements. Change length of video: easily adjust video and audio length for individual needs. Cropping video material: mark the video you want to remain in the selected video frame and create a new video. Split video material: split material into two parts. Trim video material and change playback speed: delete selected parts of a video. You can make playback speed slower or faster. Diversified video and audio effects include video mixing, transition effects, film insertion, PIP (picture in picture), and 3D dynamic effects. Add special effects in video material, such as TV Wall, Close-up, Relief, Mosaic, Ripples, Sphere, Whirlpool, Tilt, Gradient, Scaling, Negative, Rewind, and Mirror. Built-in sound effects. Wav, wma or self-recorded sound effects can be imported. The fade-in, fade-out, and echo effects with special sound effects are designed for background music, which usually takes an important role in a film. Appropriate background music makes your film more attractive. Through Shot Sheet/Time Axis, you can import media, merge video, insert transition effects, add sound with special effects, and then preview your project. 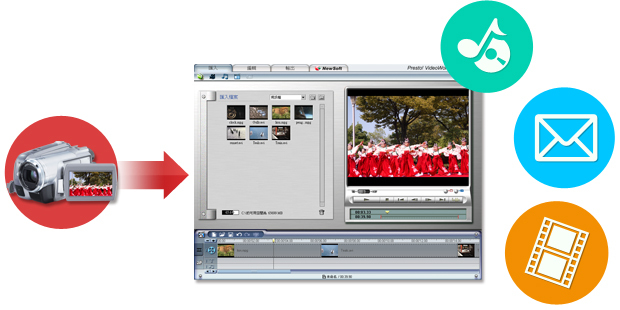 VideoWorks Platinum Edition is an easy-to-use video and audio processing application. It has a lot of powerful features like capturing, editing, producing, and recording which are well suited for both video editing novices and advanced users. With the user-friendly interface, you can easily follow steps without much special know-how. The built-in video effects, rich text effects, transition effects, and audio and video templates allow you edit with ease. Whether it is a family film or wedding, graduation, or travel log Video Works Platinum can help your best ideas come true. 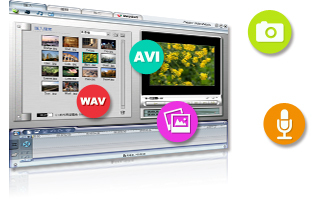 NewSoft has been committed to digital video and audio editing for nearly 20 years. Our strong technical background can integrate the video processing flow with video input devices. Layer-editing and a variety of video processing and special effects can be used. If you have any need for video or audio editing, rearranging, and processing, please contact us.